Size chart for our Standard tanks up to 10,000 litres, details for tanks beyond this size up to 90,000 litres and other sizes are available on request. All sizes are available in plain or preinsulated, if there is not a size that you require please contact us as we can manufacture tanks to many other sizes. 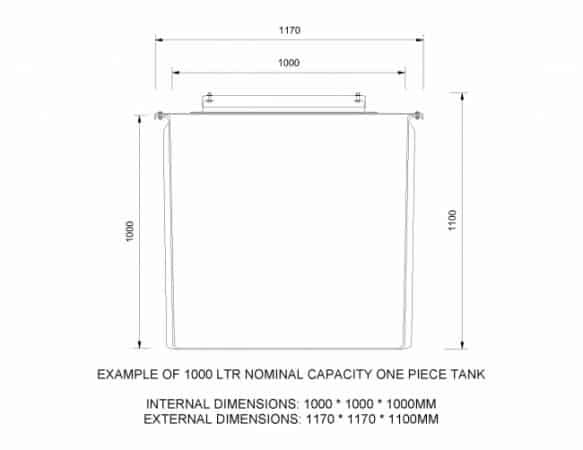 All tanks below 1000 litres do not require an Inspection Hatch for byelaws. All sizes are in Millimeters and are approximate. All capacities are Nominal (to the top of the tank). All tank walls are manufactured with a slight taper therefore sizes are considered approximate only. All tanks include an Inspection Hatch in the lid for byelaws. For sizes over 10000 litres please contact us.